Much like last year, Johan and I decided to skip town for Christmas and New Year’s Eve. Our plans once again included Hong Kong, but in the spirit of adventure we also wanted to spend a few days somewhere entirely new. That “somewhere” ended up being the small city of Hoi An, located along the central Vietnamese coast. We left Nuremberg on 24 December and three planes, many hours, and my first [glorious!] long-haul business class flight later, we arrived at Da Nang airport. While Johan was able to breeze into the country with his Swedish passport, my US citizenship meant that I needed a visa to enter Vietnam. 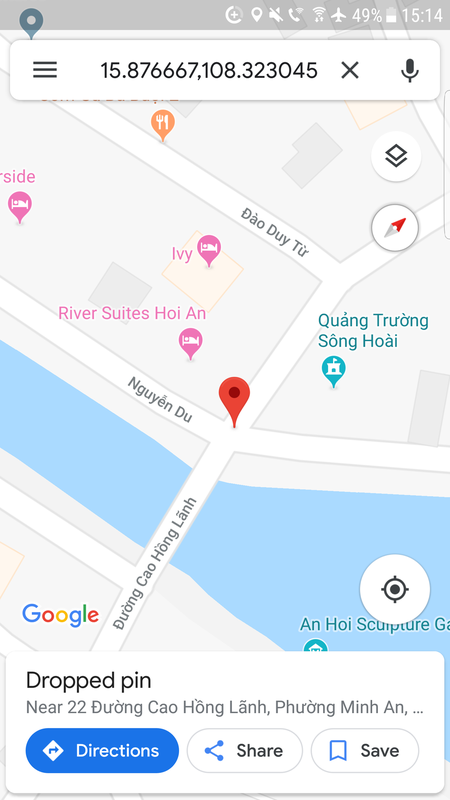 I’d already arranged for visa-on-arrival approval through VietnamVisa.org—which I’m happy to recommend as the process took all of about five minutes and a $12 fee to apply for, and I had a letter of approval in my email just a couple of days later. I’d dutifully printed this off, snapped a fresh lot of passport photos, and arrived in Da Nang with everything except the further $25 fee allegedly payable only in USD or VND cash. I’d been banking on access to an ATM from which I could withdraw USD or Vietnamese Dong (hehe) upon arrival, so of course there wasn’t one. Fortunately, I had 25 in Euro cash and was able to pay with that after all, but be advised that if you’re arriving at Da Nang Airport, you should have appropriate cash ready to go (rather than blowing past all the ATMs at Amsterdam Schiphol figuring you’ll be fine to wait until Vietnam, like I did). There’s also no currency exchange desk and no one is going to do the math to convert your alternate currency to USD, so don’t expect applicable change if they do accept your foreign cash. Don’t be alarmed by the disorder at the visa counter, either. You’ll hand over your passport and paperwork for someone to disappear off with for several minutes while you stand among a small crowd of others awaiting entry. Periodically, one of the attendants will come forward with a stack of passports, call out names, and when it’s your turn you’ll make your way to the front to hand over $25 and get your passport back. Legalities completed, we proceeded through customs and a further 45-minute transfer saw us to our accommodations in Hoi An. Par for our course, we set out in search of food after a round of happy hour beers at the hotel. 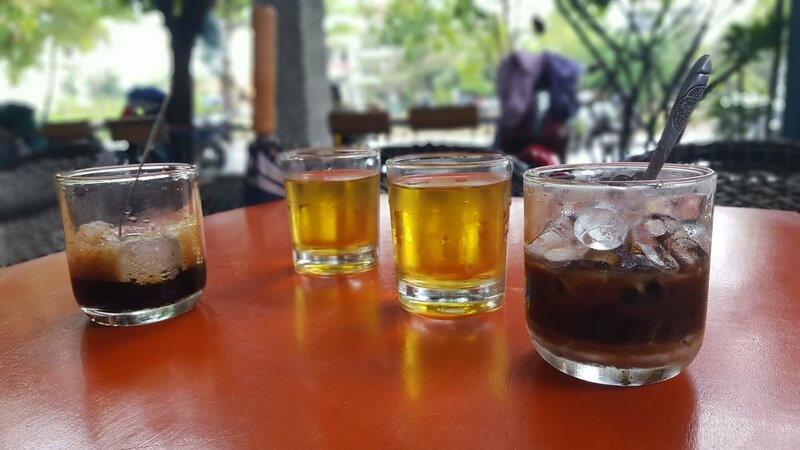 Our wanderings took us to Heo Cuốn Bánh Tráng, an open-air cafe where a helpful girl directed us toward fresh, DIY spring rolls, spicy beef in a clay pot, and beer served over ice. She showed us how to properly assemble the spring rolls, which involved laying a small piece of rice paper perpendicularly across a longer one, then placing a slice of roast pork in the middle and loading up the rest with fresh herbs and veggies before rolling tightly and dipping into tangy sauce. 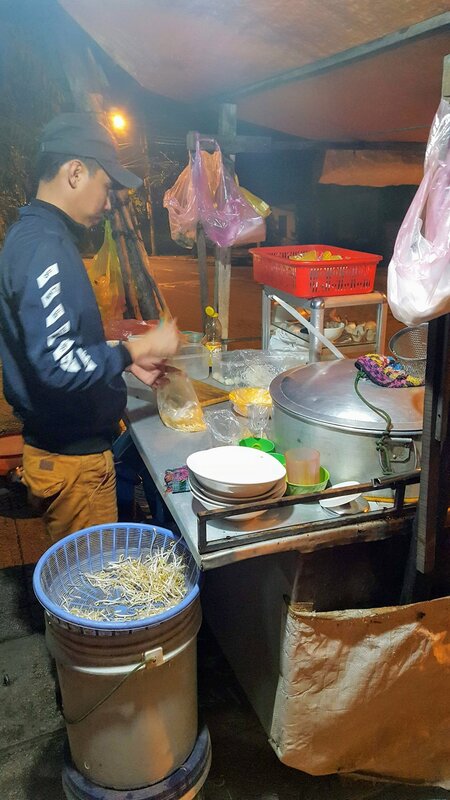 As the kitchen closed before we’d had our fill (of curiosity more than actual stomach space), we paid and continued about a block further down the street until we came upon a man with a cart selling noodles. Moments later, Johan and I were sharing one of the most lovely bowls I’ve had: chewy rice noodles swimming in a rich chicken broth, accompanied by a quail egg, lots of lettuce leaves, and delightfully crunchy bits of pork rind. This bowl of excellence cost 20 VND, or about .75 EUR, and we enjoyed it perched on tiny plastic stools on the sidewalk behind the cart. 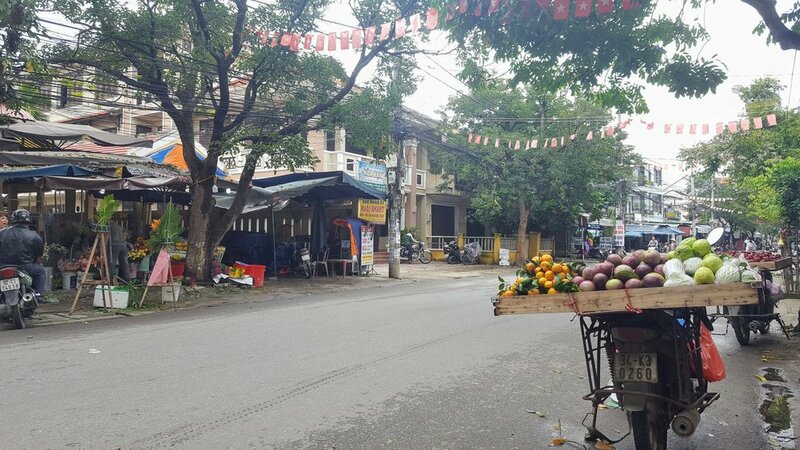 The next day, we knew wanted to check out the Hoi An Ancient Town. A trading port dating back to the 15th century, the Ancient Town is a UNESCO World Heritage Site thanks to its remarkable preservation. Under grey, drizzly skies we set out with umbrellas for the 20-minute walk into town from our hotel (borrowing bicycles was also an option, but between the rain and frantic scooter traffic we opted for the safety of our own feet). We stopped at a cafe, XOFA Coffee, along the way to try a traditional iced brew. Though I usually take mine black, I opted for a “white” coffee with condensed milk as I wanted to try one of the famed Vietnamese coffees I’ve heard so much about. It was an absolute delight; deep and roasty with notes of chocolate and caramel—sweet, yes, but far from off-putting. What a treasure Vietnamese coffee is in its pure state, though. So flavorful! The roasted, chocolatey flavors are balanced and moreish, served in small portions and accompanied by a glass of mild green tea. Caffeinated, we continued on, suspecting that we must be getting closer to the old town when we noticed an increasing prevalence of tailors lining the streets. Seemingly every other storefront around the heart of Hoi An is a tailor shop, most of which are adorned with the smiling face of a woman encouraging you to come in and have a look. If you don’t see anything you like, no problem, they can create custom pieces for you in a matter of days or even hours. The art of tailoring is a longstanding tradition in the city and while we didn’t spring for any custom clothing during our visit, I would encourage you to do your research if this sort of thing is of interest. There are quite literally hundreds of tailor shops throughout Hoi An, so price, selection of fabrics, and quality of craftsmanship will certainly vary. Fortunately, there’s still much to see if, like me, your interest in food and observation tends to surpass your interest in clothing. 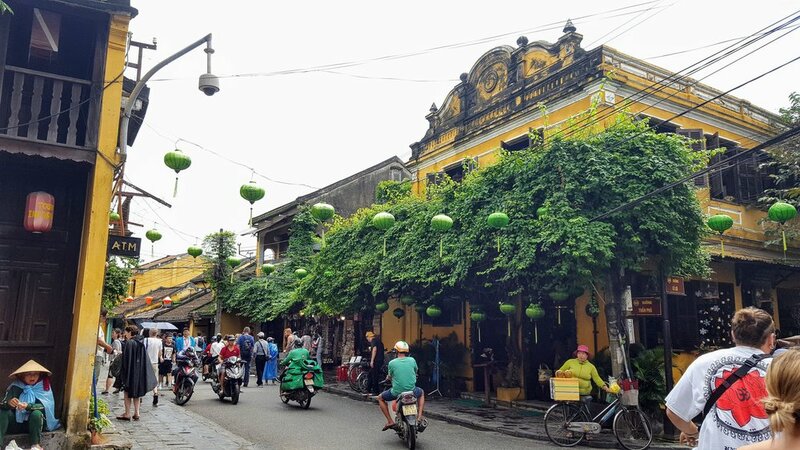 Despite the charm of heritage buildings and dangling lanterns, I didn’t love Hoi An’s Ancient City. Like many touristic destinations, this one was ripe with tacky t-shirt shops and those souvenir-peddling storefronts that could be essentially any city were it not for the telltale “I heart [destination]” wares reminding passersby of where they’ve landed this time. I do respect the hustle and I won’t begrudge anyone the opportunity to make a little money, but I find these types of shops discouraging when it feels as though they’ve been copied and pasted throughout a district that I’d hoped would evoke a sense of local culture and spark a further appreciation for the city’s history. 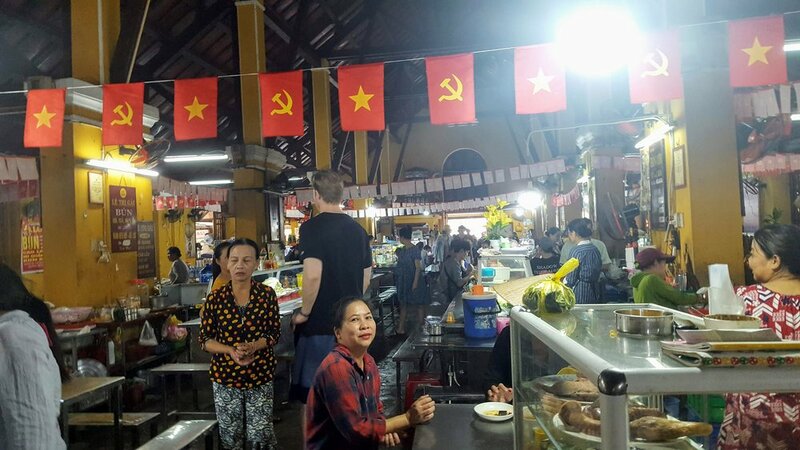 That said, I found the people of Hoi An to be friendly and welcoming, the food delicious, the coffee exceptional, and nearly anywhere away from the old town itself to be much more representative of what daily life must otherwise be like. Cao lầu is a noodle dish so specific to Hoi An that, if made properly, the water used to make the rice noodles must come from a special ancient well, which is then mixed with ash from a specific type of tree found on the nearby Cham islands. Whether this is folklore or not, cao lau does have a unique flavor, further leveled-up with thin slices of barbecue pork, crunchy [pork!] bits, and fresh herbs. Mì Quảng noodles are another traditional Hoi An dish; again with chewy rice noodles, pork slices, lots of herbs, and a turmeric-infused broth. Peanuts, a boiled quail egg, and a lone shrimp may serve as a garnish. 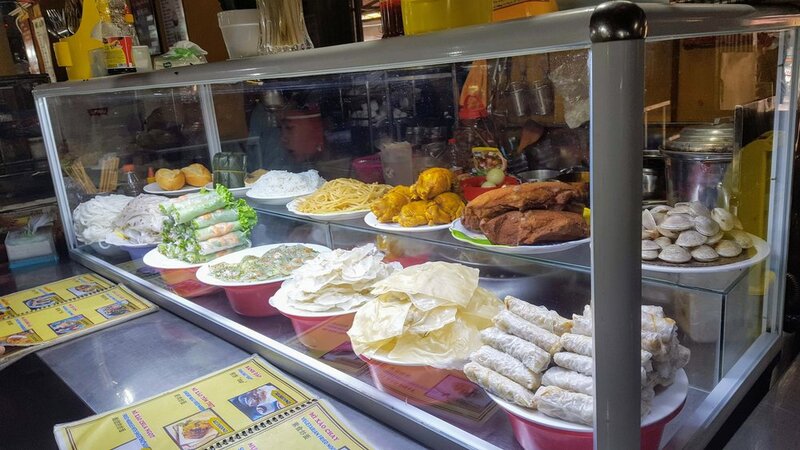 As with the noodles, there’s no shortage of opportunity to acquire banh mi in Hoi An, so feel free to explore and find your own favorite. We stayed at Rosemary Boutique Hotel, which is a a 4-star, relatively new property located 2.4 km / 1.5 mi outside of the Ancient Town. This endorsement is not at all sponsored, we were just quite pleased with the hotel and service. For about 180 EUR / 205 USD in total, we spent three nights, enjoyed a lovely breakfast each morning, we both had an hour-long Vietnamese massage at the spa, plus the aforementioned beers shortly after our arrival. Our room was a spacious 35 m² / 376 ft² with a balcony overlooking the pool and surrounding neighborhood. The hotel is also in the process of working on a rooftop bar, which should be clutch when finished (at least on days when weather conditions are something other than hot rain). 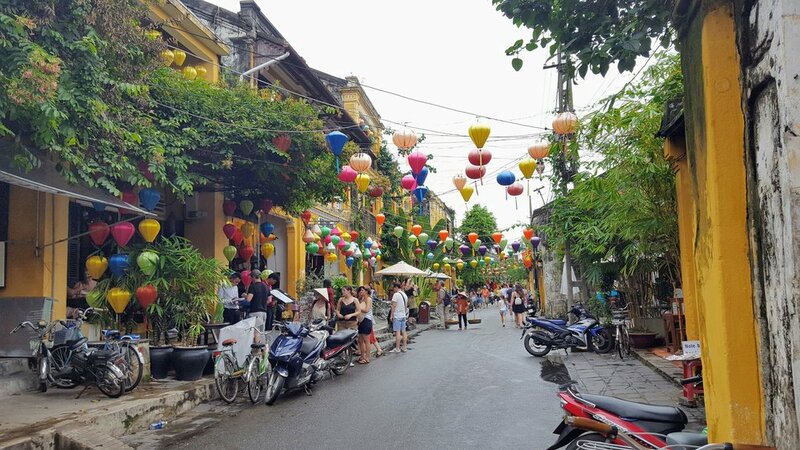 There are a few luxury properties in the Hoi An area as well, like the Four Seasons and the Anantara Resort, as well as a smattering of hostels and other budget accommodation options. I actually….don’t have anything specific to mention here. Sorry! Our general travel philosophy is “show up and see what happens,” which usually involves a lot of aimless wandering and minimal advance planning. Do check out the Ancient Town, but don’t give it all of your time. We discovered later than we’d have preferred that taking a left out of the Rosemary (instead of a right towards the old town) leads to a bustling outdoor food market and several small eateries. Your hotel or host should certainly be able to offer recommendations if you’re interested in taking a tour or one of the various regional excursions that are available. 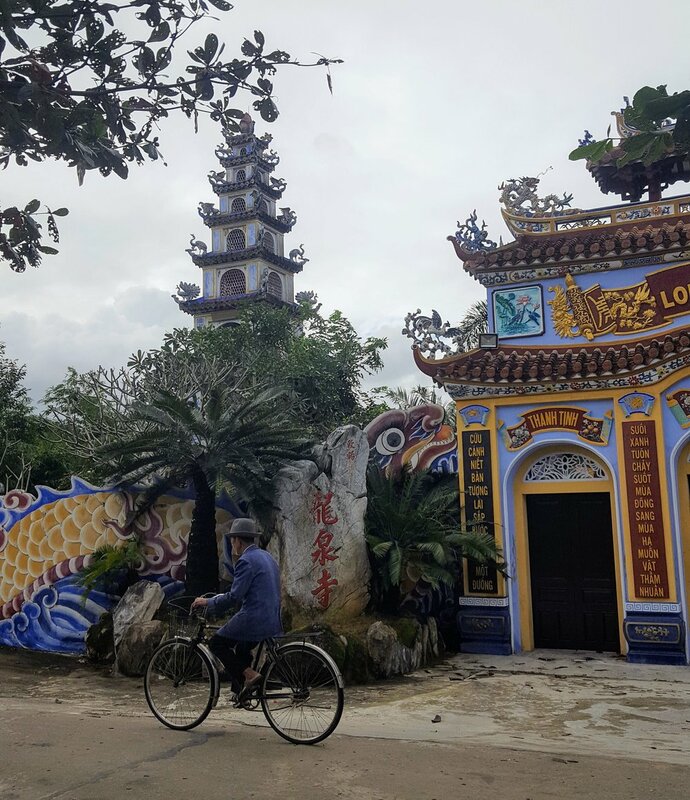 I’ve also read in a few places that people tend to overlook the offerings of Da Nang in favor of Hoi An, which may well be the case as we also didn’t experience Da Nang at all beyond flying into and out of its airport. If you’ve been to Hoi An, I’d love to hear your impressions!